Browse this neat poster set created by Flickr user pope saint victor tied to the 40 Days of Water effort from Blood:Water Mission. This initiative is encouraging groups and individuals to drink water as their only beverage for the 40 Days between February 17th and April 3rd. Water for thirst and food for thought, too! 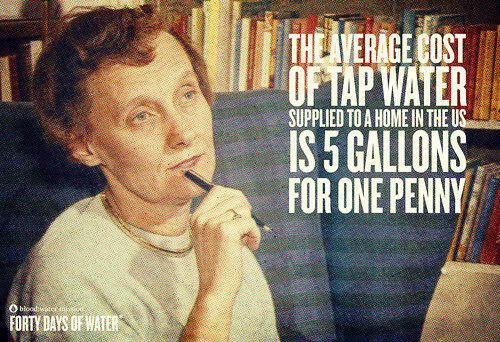 40 days of water facts. fact #20., originally uploaded by pope saint victor. I find it interesting that people are willing to up to $5.00 and more for bottled water yet they complain about the price of gas. We can have good clean water at point of use for just pennies a day and be assured of the quality. I also like the idea about water as the only beverage for 40 days. I think everyone who does it will notice an appreciable difference. I’m on a well, but the local water really needs a simple charcoal activated filter to remove the chlorine and related byproducts. They are inexpensive, of course. Shocking Water Revelations via Google Auto-Suggest Reverse Caption Contest: Wastewater Overflow!